On my travels to the flea market last weekend, I found a lovely old vintage bottle; its lid still intact for added character and charm. And priced at only $1 it was even more sweet! It made me think of the work of Anna Corba, an artist I have always admired from afar. 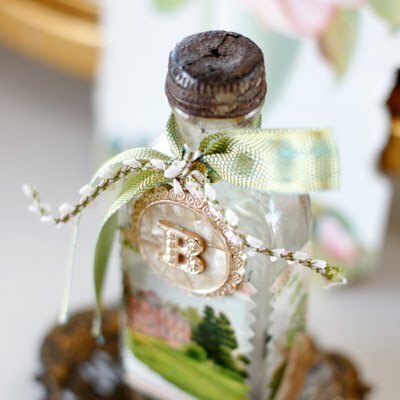 She is the queen of collecting vintage ephemera and transforming simple things such as vintage bottles, lined notebooks, gift tags and candle jars into miniature works of art. 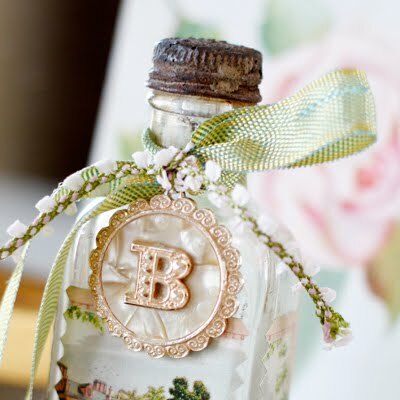 So, with my collection of vintage ephemera such as silk ribbon, decorative cord, playing card, and letter medalion, I set out to create my own version of an ‘Anna Corba inspired’ vintage bottle. It was so simple to make but I think the result is amazing. So pretty!